Economical ISO 9001 & RoHS Certified Manufacturing! LED Display Panels, Extrusions, Punch Press, Welding, Anodization, Sheet Metal Fabrications & more! Below is a list of retail display fixtures we’ve previously manufactured in the past, this by no means is what we are limited to producing. All of our manufacturing is custom to our customers design, throw us a drawing and we’ll see what we can do for you. Feel free to email us at sales@antou.com! 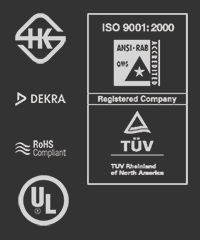 Our products are compliant and certified with ISO 9001: 2000, RoHS, CSA, KEMA, Hong Kong Safety and UL.